The condition can be triggered by stress. Kim Kardashian has only recently come out of her social media blackout following her horrific Paris robbery ordeal. Considering that only a month later, her husband, Kanye West, was hospitalized after suffering a breakdown, we cannot even begin to imagine the stress Kimmy must be under. In the past, Kim has been open about her struggle with psoriasis, a skin condition that causes red, flaky, crusty patches of skin. It is a condition that her mom, the OG Kardashian, Kris Jenner also suffers from. 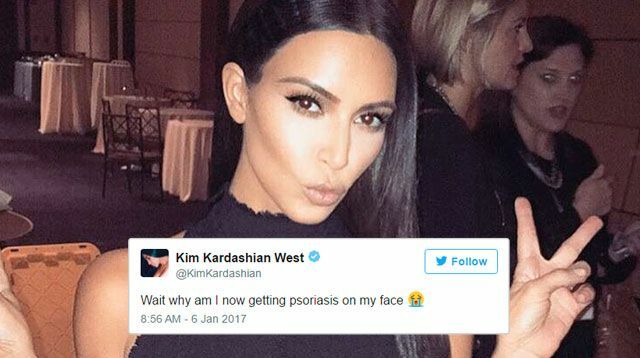 As well as visiting a dermatologist on an episode of Keeping Up With The Kardashians, Kim wrote about her experience with the condition on her website last year. "Everyone with psoriasis has different symptoms; sometimes the rashes are itchy, sometimes they're flaky. Mine flares up from time to time for different reasons." "I'm always hoping for a cure, of course, but in the meantime, I'm learning to just accept it as part of who I am." "Sometimes I just feel like it's my big flaw and everyone knows about it, so why cover it?" But on her Twitter, Kim has now opened up and confessed the condition has worsened and spread to her face. Psoriasis is a chronic disease where you can have periods of little to no symptoms, followed by more severe flare-ups. It is caused by a problem with the immune system attacking healthy cells by mistake. It's incredibly brave of Kim to open up about her personal health issues, as it's something that many people suffering from the same condition will be able to relate to. Hopefully with continued treatment, Kimmy will be able to reduce her symptoms again.